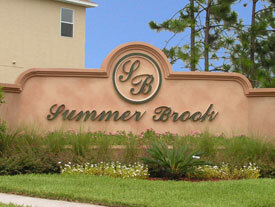 Summer Brook community in Jacksonville, Florida. Summer Brook is a new residential community with 167 homes located in the sought after Intracoastal area off Kernan Blvd. north of Atlantic Blvd. Summerbrook features a relaxed family atmosphere, and is convenient to downtown, beaches, recreation, businesses entertainment, schools, and more. A middle school and an elementary school are within walking distance of the community. Summer Brook features a community pool, a playground, a clubhouse and all homes come with full irrigation systems and sodded yards. Homesites ranging in size from 1,400 square feet to 2,000 square feet with pricing from the upper $200'ss. Builders are D.R. Horton, Mercedes Homes.